"Today we’re presenting a new Opera 58. In this cycle we wanted to focus on further bug fixes, and small improvements." - DNA-72877 [Linux] VPN takes long time to connect. - DNA-72935 Too much spacing between favicons on the bookmark bar. - The Chromium has been updated to version 71.0.3559.6. "We’ve got a fresh Opera 58 developer update for you this Monday, with a new novelty in the browser. - Next to a tab (in the empty space) to open a new one. We’ve also added a nice, new wallpaper. Check it out, along with all the other great ones. - Suggestions on the search bar are visible now in the dark mode. - Pop-ups opened in full screen mode open in new tabs. - Keyboard shortcuts are again displayed for options in menus. - Changing the wallpaper from SD’s context menu is not working. Known issue: DNA-73106 [Win] Access denied security badge is shown, even after permission request was allowed." 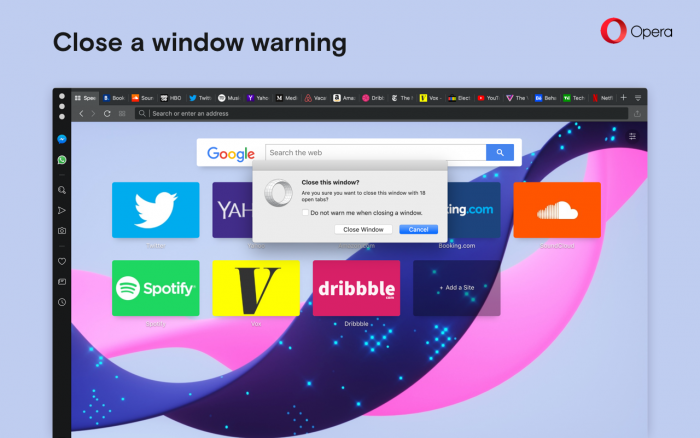 To help prevent losing your data, when filling out forms, or writing comments by accidentally closing all tabs, we added confirmation dialog to warn you about closing a browser window with multiple tabs. If you don’t want this window to appear, just mark checkbox “Do not show this warning again”. This dialog will not be shown for private windows. - You can’t copy using Cmd+C (macOS), if Search & Copy Popup is displayed." - DNA-73106 [Win] Access denied security badge is shown even after permission request was allowed. - DNA-73119 [Mac] Implement new tab opening by middle click. - The Chromium has been updated to version 71.0.3573.0. - Quick Access pane improvements. - Search pop-up has the right size. - Cmd/Ctrl+C works again when search pop-up is displayed. - DNA-73190 H.264 decoding issue on macOS 10.14. - [Windows] buttons in search/copy pop-up do not work. - Search popup stays visible, when scrolling the page. - opera:news page is displayed empty by default. The Chromium has been updated to version 71.0.3578.20. "With this build we have a cool update to the news delivery mechanism for our Russian users: we have now integrated Yandex Zen into our start page, replacing our previous mechanism. Yandex Zen is a smart, personal news recommendation service. What this means for our Russian users is that they will get better news, chosen based on their preferences and browsing history. Yandex Zen uses machine-learning technology and automatically adjusts to your news preferences. You can find more information about it here. Yandex Zen has been switched on only in Russia"
I must be living on my own planet here, but yandex ... really. After facebook problems with analytica ... really ? Hmm. There's some word on the street that Opera has shifted focus to mobile browsers - the desktop application only getting bare minimum. Is desktop still strongest commitment? And what are long time plans/goals for Opera desktop application? I believe both desktop and mobile have the same commitment as always. Hi @loup001, it looks like the Opera wanted to improve the news feature, to deliver more accurate, depended on activities of the users news sources. Since Zen uses machine learning technology, which "analyzes what you read on the internet and adjusts the content of your recommendations feed to suit your interests", so it could prove to be helpful on that matter. I understoud the benefit of this technology. I was/am concern about the "spying/profiling" of users from a provider that did not address the discovery from princeton. Inclusion of this service in opera can be seen as an andorsement of such behavior. Reputation is so hard to build. - Disappearing page content, after using Snapshot tool. - Invisible bookmark bar drop indicator." Hi @loup001, you're welcome. In case, that someone would really like to spy on users using web browsers, there are many other ways to do so. I would rather not bother myself too much with that. @loup001 Yeah... I wondered the same thing. If there are "many other ways to spy on users", should we be concerned? It's bad enough that a Chinese consortium now owns the browser and I think that many of us are using it with both hesitation and some concern. Your comment did not reassure me. Do you use Facebook? Every time you see a Like button, they are spying on you. Google spies on everyone, etc. I'm sure you know this. Hi @coffeelover, my reply to loup001 is intended to make him aware of the facts, not to make anyone concerned about it, or reassured. 4. GPU side channel attacks can enable spying on web activity, password stealing. After you read it, and will still have a feeling, that you want to discus it more deeply, please start a new thread for that purpose, and when I see, that I can give you any helpful reply, I will. Thank's again for your time and concern. Seems a regular connection between Opera's VPN and your computer/router. @sgunhouse Hello, Steve. I don't use Facebook on a regular basis (i.e. only for contact to companies should issues arise with their products). I don't bother with likes and so forth. Fact is, I don't trust Zuckerberg. I don't use Google (DuckDuckGo instead). I know what you are driving at (i.e. spying is built into the internet,,, period). I try to minimize it as much as possible (and convenient). Some things make me a little more nervous than others which I've already mentioned. Thanks for your input. @l33t4opera Thank you for the links. I noted that the link to which browser is better for privacy is nearly five years old so I have to wonder about its relevance. I found this quote in the article to be interesting: "Well, your browser is probably sending some information back to the company that created it, but that information is explicitly used to support the features you have turned on. As long as you trust the developer behind your favorite browser, this isn't an issue." So... as long as I trust the developer behind my browser, this isn't an issue. And therein lies the problem for me and I know for many others.